This free html5 css3 website template is a powerful business template handcrafted by Designseer that will help you build your responsive design website. The template works well in tablet and smartphones. The CSS3 animations, portfolio integration, pricing tables, map & contact adds to the unique features of Return Template. 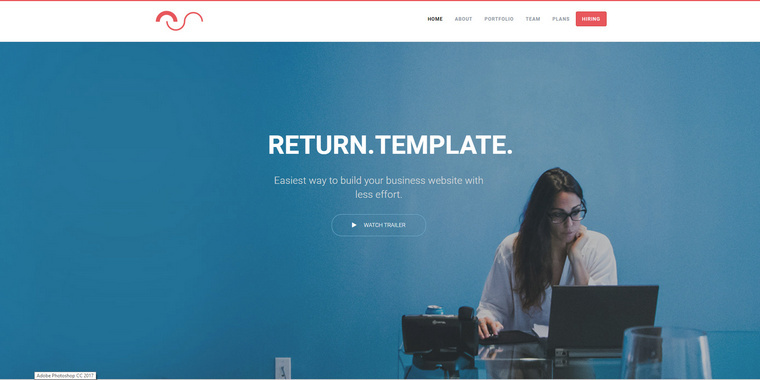 This website template is built on top of the Bootstrap framework so it will be easy to edit backend code. Fluid responsive design allows the template to work on mobiles, tablets and desktops. The template works perfectly well in modern browsers like IE9+, Chrome, Firefox, Safari etc. Clean and best coding standards are used to write valid HTML5, CSS3 markup to ensure your website ranks well in google search results. The style.css and index.html, blog.html are well commented for easy customization on the go.